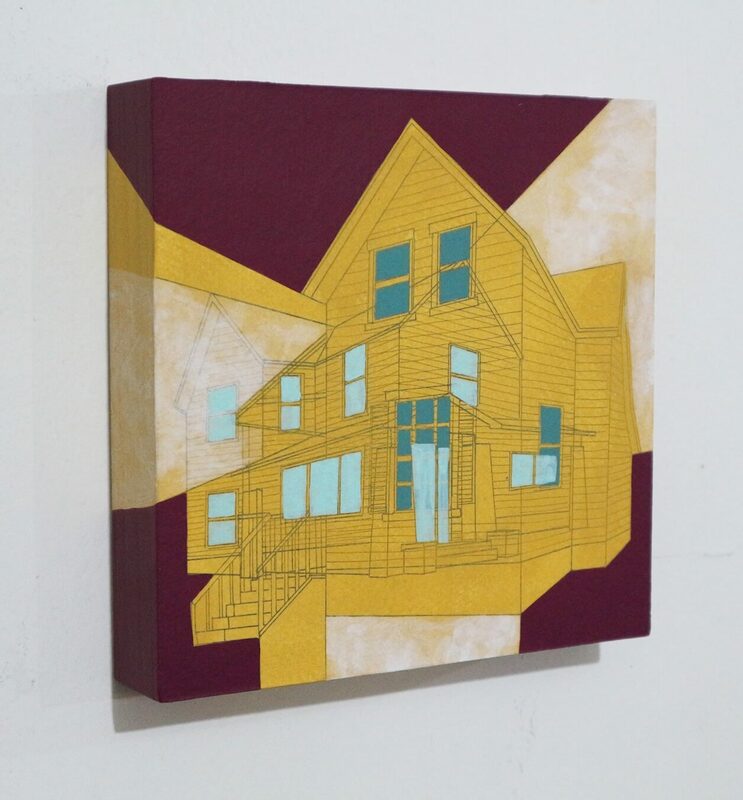 Artist Katie B. Temple has a knack for lending an appealing graphic design to even the most skeletal of her bare bones house paintings. This paradox may account then for the title of her new solo exhibit Home Sweet Home,which opens Friday, June 1, at the Little Gallery in Benson. All of the paintings, over 50 ranging from 3×5″ to 40×30″, are acrylic, gouache, and ink on paper, mounted to wood panel. 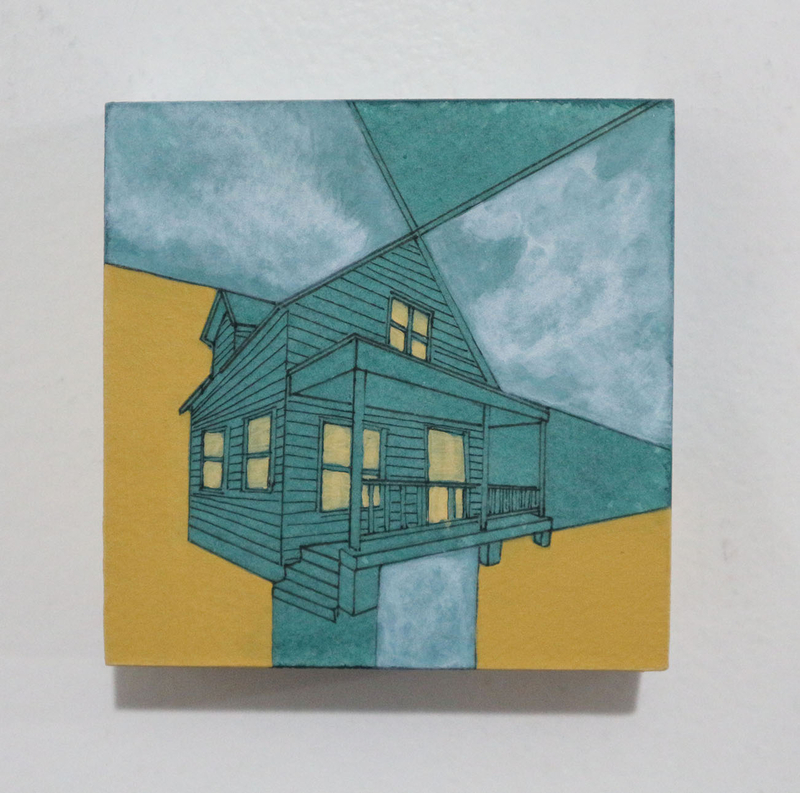 Some pieces contain a single home in one painting and other pieces contain several layered homes in one painting. “For the past three years, I have only incorporated imagery from apartment complexes, townhomes, multi-family houses, dormitories, etc. that I have lived in,” she said. 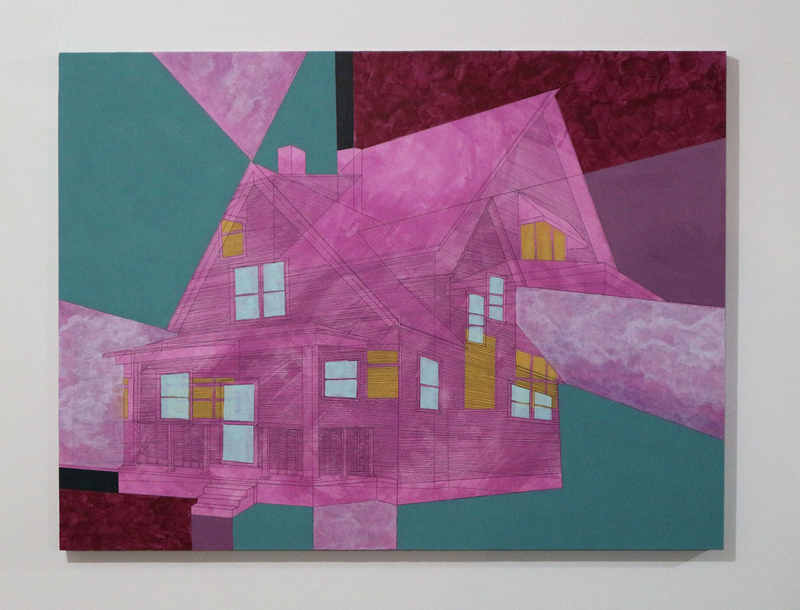 “Those works were about my personal journey of moving from place to place… how each of those homes were a vessel that held me. More anchored now at home and in her career, Temple, an Omaha artist and educator, is the studio coordinator for the Kent Bellows Mentoring Program at Joslyn Art Museum. Most of all, she is an accomplished artist who earned her BFA from Bowling Green State University and her MFA from Montana State University. Her work has been featured in various national exhibitions. Locally, she was a 2017 nominee for Best Visual Emerging Artist from the Omaha Arts and Entertainment Awards (OEAA). Temple also was nominated for two 2018 OEAA awards – one for Best Visual Emerging Artist and one for Best Presentation in a Non-Traditional Format. The little gallery will celebrate its third anniversary Friday, June 1, with cake, a pinata full of treasures and the opening of “Home Sweet Home” from 6 to 9 p.m. at 5901 Maple Street in downtown Benson. The exhibition, Home Sweet Home, will run from June 1st-30th. The Little Gallery is open Tuesday through Friday from 3:00 to 6:00pm, Saturday from 10:00am to 1:00pm and by appointment. For more information, call 402.681.1901.